VEGEMITE is a nutritious, and undeniably delicious start to the day. Rich in B vitamins to help kick start your day, open the lid on a world of ways to START WITH VEGEMITE. The B vitamins (thiamin B1, riboflavin B2, niacin B3 and folate) in VEGEMITE provide vitality to help get your day started. Thiamin is essential for brain function, Riboflavin supports your nervous system, Niacin is essential for energy release and Folate helps to fight fatigue. VEGEMITE spread is virtually fat-free, with a mere 36kJ in a 5g serve, and is the perfect accompaniment for a wholesome breakfast, lunch or snack. 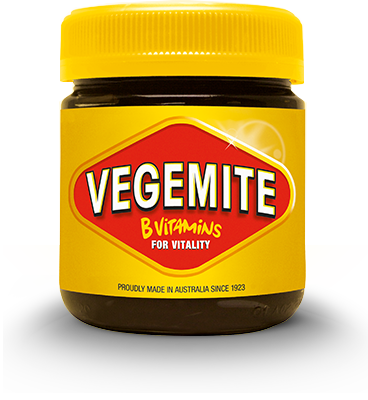 In fact, its unique and delicious flavour is what distinguishes VEGEMITE. We recommend VEGEMITE be enjoyed as part of a balanced, varied diet, and active lifestyle. ** RDI for adults is 200μg, or for women of childbearing age 400μg. It is important to maintain a varied diet. You asked and we delivered. Help kick start your day with Reduced Salt VEGEMITE, a specially formulated VEGEMITE spread with extra B vitamins and 25 per cent less salt (and sodium) than the original! Reduced Salt VEGEMITE is best enjoyed by the many Australians consciously reducing their salt intake for health and wellbeing reasons. Older Australians and parents wishing to choose lower salt options for the family will love Reduced Salt VEGEMITE for a nutritious accompaniment to breakfast, lunch or a snack. 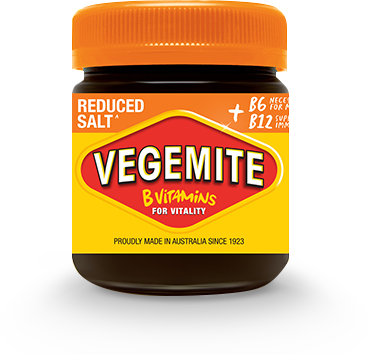 Inspired by VEGEMITE lovers’ requests, Reduced Salt VEGEMITE is fortified with additional B vitamins (B6 and B12). Vitamins B6 and B12 are necessary for metabolism, supporting the immune system and brain function. Enjoy Reduced Salt VEGEMITE as part of a balanced, varied diet and active lifestyle. Happy little VEGEMITES rejoice! Australia’s favourite spread is now available in Gluten Free! The same great taste you love, now gluten free and FODMAP friendly. 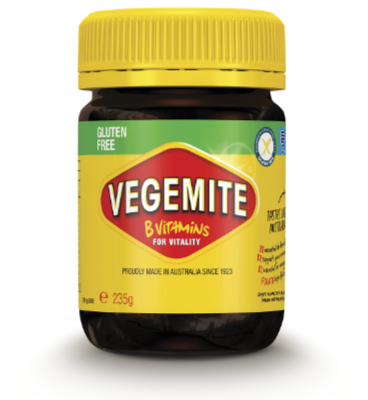 Driven by consumer demand, VEGEMITE Gluten Free ensures gluten avoiders and Aussies suffering with Coeliac Disease can now enjoy VEGEMITE as part of their everyday diet. Still packed with all the same great benefits of VEGEMITE Original but now in Gluten Free and FODMAP friendly, we also get the tick of approval from our friends at Coeliac Australia and Monash Low FODMAP which is very important to us. VEGEMITE CHEESYBITE spread is the delicious combination of VEGEMITE spread and cream cheese, perfectly suited to go on anything at any time, and offering the B Vitamins you get from the VEGEMITE spread. It can be spread straight on to crackers, wholemeal or grainy bread, pita, fresh vegetables… virtually anything you like! VEGEMITE CHEESYBITE spread has less fat than many other spreads and dips, and the creaminess to this tasty product erases the need for butter. A small amount of VEGEMITE CHEESYBITE spread goes a long way. 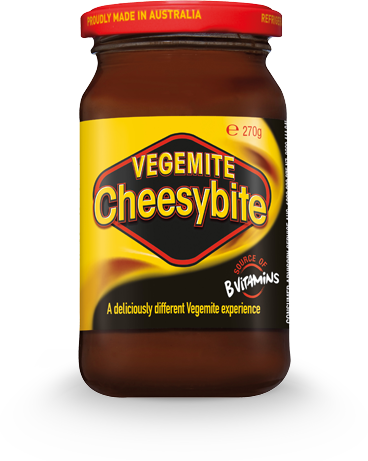 VEGEMITE CHEESYBITE spread is halal and kosher certified and each serve provides 26% of your RDI of thiamine and folate and 13% of your RDI of riboflavin and niacin in each serve. It’s an enjoyable taste experience, much like VEGEMITE spread, but in a more subtle and smooth way. As VEGEMITE CHEESYBITE spread contains dairy, refrigerate it after opening and consume it within four weeks.